This story reads like an infomercial for IBM, which it probably is. 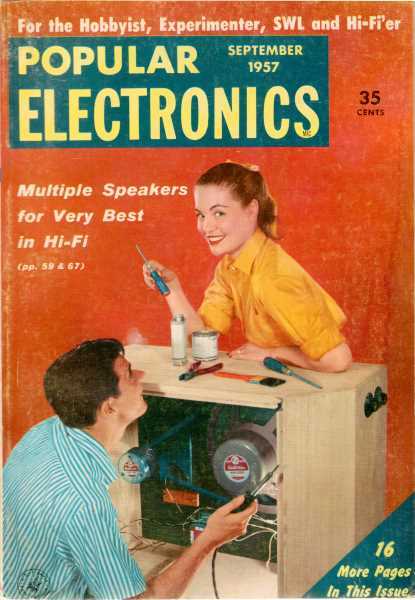 Of course infomercials had not been invented by 1957, so IBM was ahead of its time. 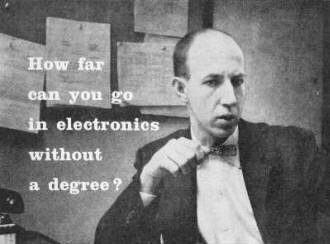 The answer to the article's title, "How Far Can You Go in Electronics Without a Degree?" was the same 55 years ago as it is today: As far as your intellect and ambition will take you. 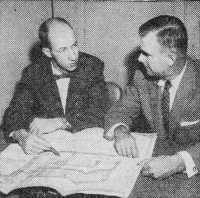 Back then, as with today, few people could rise to the level of design engineer without a college degree. However, there are many aspects of electronics that requires no formal education at all if you possess the requisite skills. I never have bought into the feel-good lie about anyone being able to be whatever he or she wants to be. Some people simply cannot achieve the mastery necessary to do a particular job. Two years ago, degreeless Bill Miles had reached a blind alley in his career. Yet today, with IBM, he's actually supervising engineers in America's biggest electronics project. Here's how this technician broke through the "education barrier." 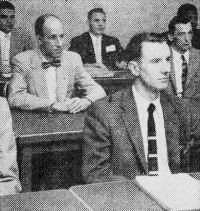 "Training and local assignments," recalls Bill Miles, "were what caught my eye when I saw an IBM ad in 1955. So I investigated. Now here I am with an advanced electronics education under my belt - and responsibility as a Group Supervisor in Project SAGE. I work on the world's largest and most advanced computer. I live in my home town. And my future in the company is what I make it. Yet only 2 years ago, I thought I'd gone as far as a technician ever could!" Becomes Radar Technician. Bill's background is typical of thousands of capable, ambitious technicians who never acquired a formal engineering degree. His interest in electronics, aroused in Camden, New Jersey, high school, was nourished by a 3-year stint as Aviation Radar Technician in the Navy's "Black Cat" air-sea rescue squadron. Bill gets electronic computer education at IBM Kingston. 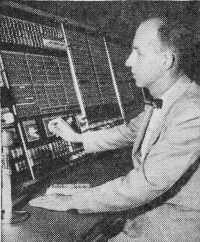 Miles does diagnostic programming on the Operating Console of the SAGE Computer. Miles nails down problem with Site Manager R. Schimmel. 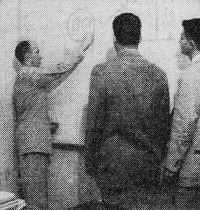 "Student" Bill Miles diagrams computer circuit. Discharged in 1946, Bill married a girl he'd known in high school. During the next 9 years, Bill was teacher in a radio-TV institute, TV service man, TV company technician, and chief supervisory TV technician. All the while he pursued an engineering education at night. But growing family responsibilities made it more and more difficult. Finds Doors Barred. However, feeling he was equipped for greater responsibility, Bill, now 30, investigated several companies but found that, while they liked his abilities, his lack of degree barred the door to significant advancement. Enters IBM School. In May 1955, when he moved his family to Kingston, New York, and started at IBM, Bill wasn't quite sure what to expect. The 8-month training course - valued at many thousands of dollars per man - had been the big magnet for him. "Sixty of us started school at IBM, attending class 8 hours a day. The course consisted of about 20 subjects, mostly dealing with computer circuits and units, and maintenance techniques. The teaching was adult, superb. During training, we received a living expense allowance, over and above salary. We kept our own grades, and every 6 weeks when we reviewed them with the instructors, they asked us for ways to improve the course. I expected a casual 'hello' when I met the Division Manager of Education, but he talked to me for an hour about myself and my interests. IBM has real concern for you as an individual, both before and after they hire you." Joins Home-Town Computer Site. Bill had joined IBM as a Field Systems Engineer. After graduation, Bill was assigned to a computer site near his home in Mt. Holly, New Jersey, with IBM paying his moving expenses. For the first two months he helped install the SAGE computer, an important link in America's air defense. Ultimately, such computers will ring America's entire air defense perimeter. World's Largest Computer. "The computer is probably the largest one in the world, with over a million components. Flattened out, it would probably fill a ball field. The computer analyzes radar data on every object in the sky. Then it checks each object against available traffic information and identifies it as either friendly or hostile. It can make suggestions, but it can't send a Nike missile against what it thinks is a 'baddie.' Only airmen can make that decision." Supervises Fifteen. Recently promoted to Group Supervisor, Bill now directs an entire shift of 15 men, reporting to a Group Manager. His job: to maintain the computer in combat readiness. "I have to be familiar with the entire system. I rely on two types of specialists to help me: computer units men who are specialists in certain areas; systems engineers for the over-all computer." But the question remains: Is Bill really an engineer? "No, I certainly don't consider myself a 'professional' engineer, qualified to design machines, for instance. But the point is, I'm doing work ordinarily done by engineers ... work usually denied to men without a degree." IBM Upgrades Technicians. Could he do this elsewhere? "Of all the companies I know, IBM appears to be one of the few upgrading the technician to the level of engineering responsibility. Fortunately for me, IBM had the imagination to get men without degrees and encourage them to rise in responsibility and income to the level of their native talents ... not what their formal education dictates." Since Bill Miles joined IBM, opportunities in the Project SAGE program, destined for long-range national importance, have grown more promising than ever. If IBM considers your experience equivalent to an E.E., M.E. or Physics degree, you'll receive 8 months' training, as a Computer Systems Engineer. If you have 2 years' technical school­ing or the equivalent experience, you'll receive 6 months' training, as a Computer Units Field Engineer, with opportunity to assume full engineering responsibility. Assignment in area of your choice. Every channel of advancement in entire company open - and IBM is leader in a field that's skyrocketing in growth. All the customary benefits and more. Write to Mr. N. H. Heyer, Room No. 12609, IBM, Kingston, New York.